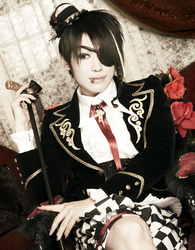 Kanon is the former bassist for the dormant Harajuku-type dance-rock band "An Cafe". He has newly established a music office, the Studio Blue to provide on the world-wide bases the "playground of new value-system" as a producer. He is currently the producer for the recently released mobile phone game, Pinky Distortion. Pinky Distortion features DIS;CODE, a visual kei band in search of a vocalist. The player takes the role of a young girl recruited as the band's manager, who must find a way to keep the band together and lead them to their first successful live concert. The game emphasizes kanon's belief that a group of passionate people can create something more amazing than any individual.